Other people might send a plain, dull note, but not you. 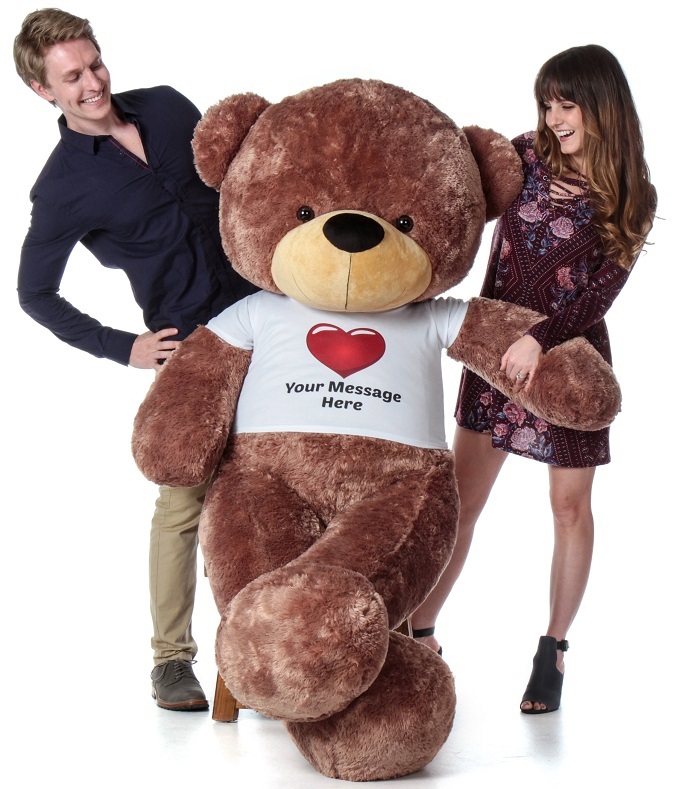 YOU know that sending your message on a personalized 6ft (72in) teddy bear will make that someone special remember it (and you) forever! Sunny Cuddles makes an adorable messenger, with super soft mocha brown fur, a velvety plush black nose and a sweet teddy bear face that melts hearts. He’s wearing our awesome Red Heart shirt, and we’ll print your special 3-5 word message on the front for a personal gift that will always be remembered. I got this for a very special close friend of mine & she absolutely loved it. I finally received a picture and video of my little buddy with the bear we bought him last month. It's taking so long for the review because the day before it was delivered he left for St Judes to start his radiation treatment. He's home just for the weekend before he heads back and I was pleasantly surprised by how beautiful this teddy bear is. he's only 5 years old so this teddy bear is double his size. I highly recommend. Loved it! And it came really fast! The friend we bought this for LOVED, LOVED, LOVED it! We couldn't have made a better choice! A new addition to our painting studio! We are a national paint and sip franchise that wanted to bring a new member to our studio. We are 100% pleased with our Giant Teddy Bear. We have named him Easel and he is a welcomed addition. Thank you so much. Thanks very much for creating this awesome teddy,definitely I'll buy another one,very very happy. LOVE LOVE LOVE MY TEDDY!!! My fiance got my teddy to keep me company when he travels because i have such a hard time falling asleep alone, not only is it ADORABLE, but is soft and snuggly too!!! i love it! !